Condiments at Krua Thai 2. 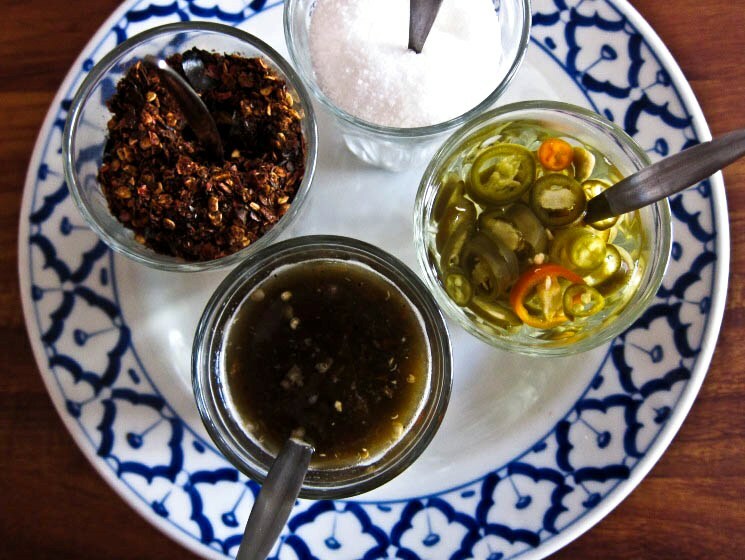 Clockwise from top: salt, pickled chilli, chilli sauce, dried chilli flakes. Edit: Krua Thai 2 no longer opens for lunch. Unfortunately, their dinner menu doesn't have the street food element I love in their lunches. However, the same people have now opened Jinda in Abbotsford, where they continue to serve the delightful meals you see below. Earlier this year, I visited Krua Thai 2 (37 Bridge Road, Richmond) with my family and really enjoyed the food there. I keep meaning to go back, but you know how it is... laziness, procrastination, all that jazz. Meanwhile, my photos and draft from that visit are lying dormant, so I figured I should write it up before I forget all the details. Krua Thai 2 is a nice little place. A cosy fitout with carved wooden decor. Humble menus with the items typed in both English and Thai. A pleasant lunchtime buzz when we went there on the weekend. I started off with a Thai iced tea with milk. This is pretty sweet stuff, which is expected, but not as sweet as most other places I've been to. And for that, they get bonus points. My uncle has taken my parents to Krua Thai 2 before and so they had all already developed some familiarity with the menu. My dad is enthusiastic about the pork noodle soup - it reminds him of the koay teow soup in Malaysia, he said. I can't NOT order it after that endorsement. Noodle with pork in clear soup, $6 for a small bowl ($9 for regular). And yes, it was scrumptious. Yes, it reminded me of home. 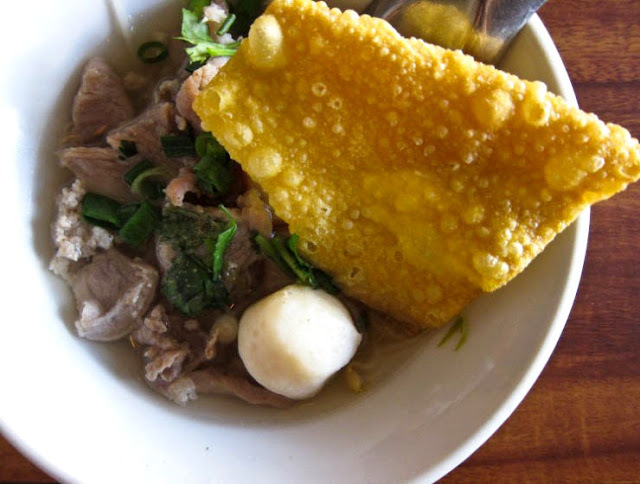 Silky noodles in a light broth, tangled with bean sprouts, topped with pieces of pork, a fishball, and a crispy cracker. Yes! Noodle with pork in clear soup, again - a shot of the half-eaten dish. This - guay-jub - is another dish I eat with fondness as it reminds me of something similar back home. 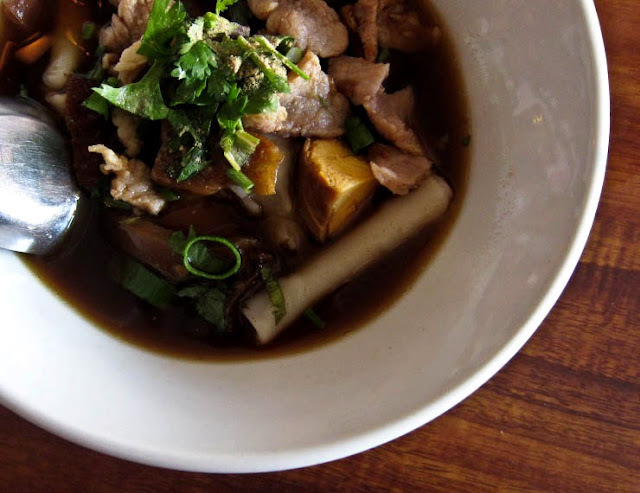 A sweet-salty-spiced soup with rolled rice noodles and a small assortment of intestinal delights. Mm-mmmm! 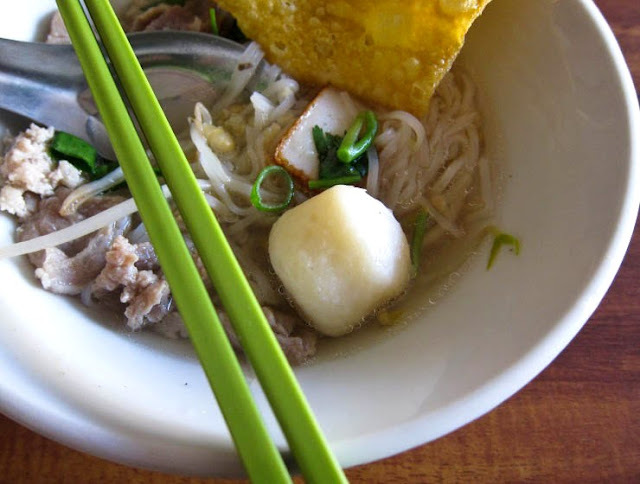 Guay-jub, $6 for a small bowl ($9 for regular). The Yen-ta-four is the odd one out as it's not something I recognize well, but it is intriguing. 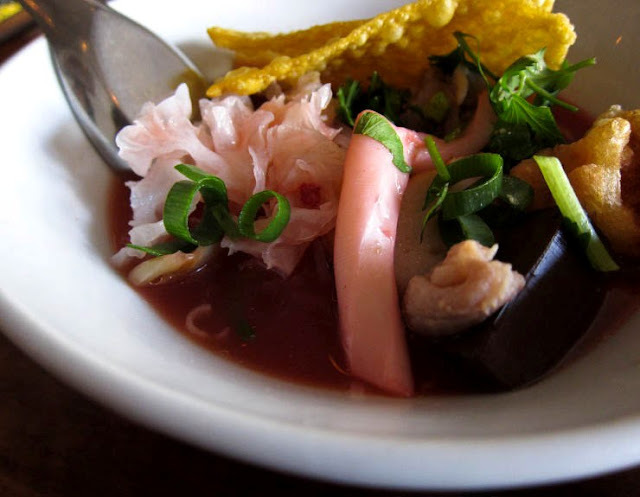 Fermented bean curd, also known as red pickled tofu, is used here, giving the dish a pink tint and a tangy, salty flavour. A bit of an acquired taste, but started to grow on me after a few spoonfuls. This also has offal in it. Check out that smooth, rich blood cube gleaming serenely by the side. Yen-ta-four (noodle with homemade special sauce), $6 for a small bowl ($9 for regular). I like how the soup noodle options at Krua Thai 2 come in two sizes - $6 for a small bowl, and $9 for a regular bowl. The small sizes really come in handy when you want more variety for your money, or if you just feel like something light. I'm keen to try more from that list. I noticed, too, that they had a good selection of rice dishes, stir-fries, plus snacks like deep fried chicken wings and grilled pork skewers, which I'd be interested in sampling as well. So, yes... next time, when I finally get around to it. I love the descriptions here, from the gleaming blood cube that's chillin on the side of the photo, to the mention of intestinal delights:) I'd love to try these types of noodle bowls... the only item here that I've had before are the fish balls, which are maybe a bit of an acquired taste? They seem to taste much better in soup than they do on their own, at any rate! Oooh! I'll deep fry them next time, that sounds fantastic! is that white fungus in the last dish? I have never seen such exotic Thai food! PICKLED TOFU. That sounds like one of the best things ever, ever. Why have I never had that?! 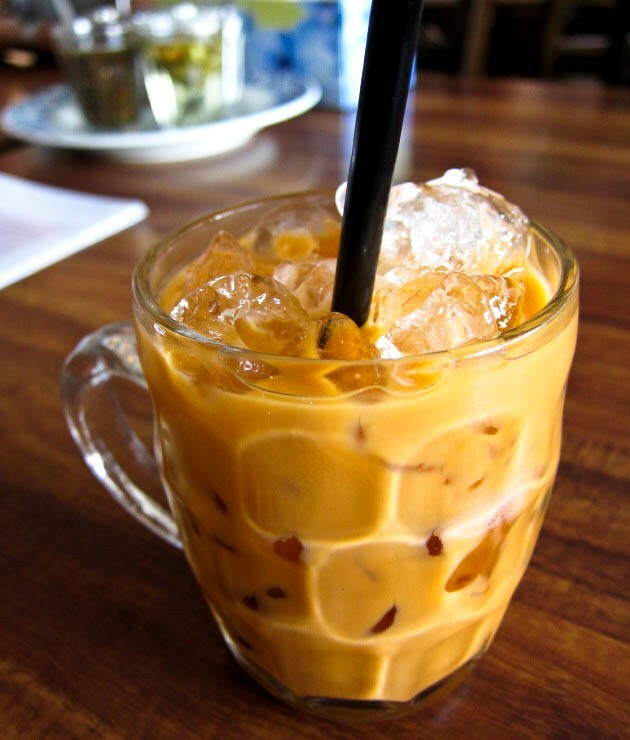 I had a packet Teh Tarik two days ago, and it was so sweet it made me feel like coughing. Pre-mix tea does tend to be on the sweeter side. And Asian teas, especially the ones that use condensed milk. Dear Lord in Heaven that looks absolutely exquisite. Okay, I might be French and all, but there's a whole new world of gastronomic possibility out there! The pictures are frigging amazing! Thanks for the showcase! This Thai restaurant looks awesome! We have some around here, but the food doesn't seem nearly as authentic as you have shown here. Looks great. i should check them out, used to do some advertising work for them ages ago! That looks really tasty. I like black pudding, so I am not sure why I feel squeamish about the blood cube! I wasn't keen on blood cubes when I was a kid (though I wasn't fussy and would still eat a few if they ventured my way) but I'm starting to appreciate them a little more these days. They have a smooth, tender texture and can pair well with flavourful soups (which is what they usually go with, in Asia). 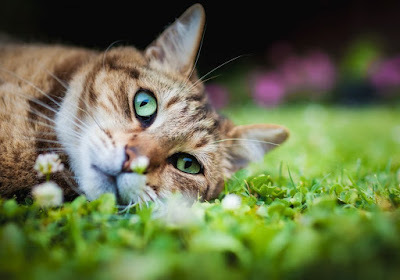 ✿✿¸.•° Cardápio diferente e interessante. That would really go down a treat in summer! Oh, how I love noodle soup. I sometimes thing I could spend the rest of my life just eating variations on noodle dishes. Looks like a great bowl of soup! Oh yes, I love my noodles, too!